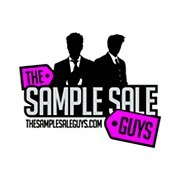 The Sample Sale Guys is an exclusive shopping Designer Sale for women and men who want designer brand apparel and accessories at prices up to 80% off retail. We only obtain authentic designer merchandise. Each event starts at a specific time and typically lasts only for 3-4 days. After each event ends the merchandise is no longer available. Our sales are open to the public and Free entrance.